In a large Dutch oven, add oil, and heat over medium heat for 5 minutes. Add flour, and whisk until combined. Lower heat to medium-low, and cook, stirring, until a dark chocolate roux forms, 30 to 40 minutes. Add onion, bell peppers, and celery, and cook, stirring, until onions are tender, about 15 minutes. Add garlic, and cook 30 seconds. Add 8 cups water, Cajun seasoning, and tomato. Bring to a boil; reduce heat, and simmer 1 hour. Stir in shrimp, okra, and crawfish. Bring to a boil; reduce heat, and simmer 15 minutes. Serve with rice. Garnish with parsley and green onion, if desired. If you make the roux a dark chocolate color and then continue cooking the trinity -won’t that burn the roux? Great question, Jim! Because the trinity releases so much liquid as it cooks and dramatically lowers the temperature inside the pan, the roux should not burn at a medium-low heat. If you’re cooking at a higher temperature, you should certainly keep a close eye on it. 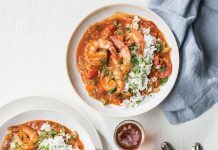 In this dish, we prefer the texture of fresh okra, but you could certainly substitute frozen okra. If im catching crawfish out of the stream, what steps do i need to take? 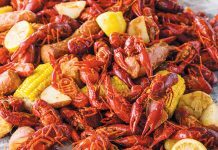 You would need to catch about 20 pounds of crawfish to get about 2 pounds of cooked tails. After thoroughly rinsing the crawfish, you would need to boil them to your liking (see this general recipe – https://www.louisianacookin.com/ultimate-crawfish-boil/ ) and then peel them. Once they’re peeled, the tail meat would be ready for this gumbo. Frozen crawfish tails are much easier. All of the ingredients will be cooked in the same pot. You will make the roux during step 1 of this recipe, then add the remaining ingredients as instructed in steps 2 and 3. Thank you I love your Recipes. Thank you!!! This looks wonderful! 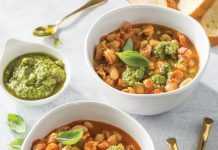 Can okra be replaced with another green? Can’t stand the taste of it? Thanks, for asking, Curtis. In this case, we wouldn’t recommend substituting anything for the okra. If you don’t care for it, just leave it out. 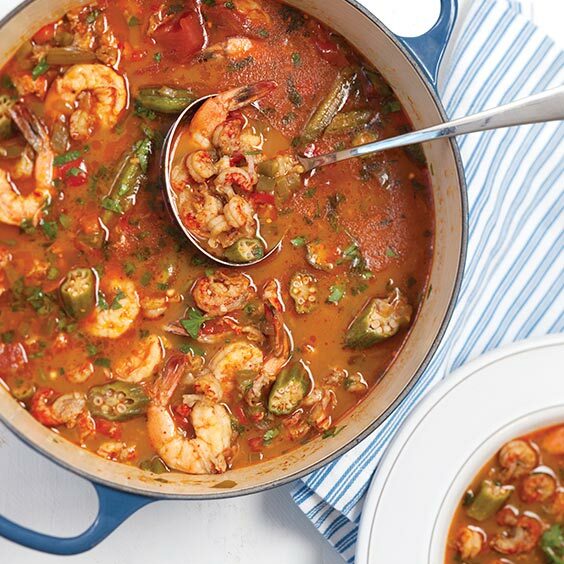 That said, if you find a shrimp gumbo that sounds good to you, you can always add/substitute crawfish. i couldn’t find okra in the local grocery store so i substituted green beans. it doesn’t have the thickening effects of okra but it tastes good! I wish I could post a picture. I am elated about this recipe. Thank You for the recipe, easy to make and delicious!! Came out great. I wasn’t able to get the roux quite as dark as you recommended and I used pickled okra, but it was deelicious. I toyed with the idea of adding sausage and maybe some chicken, but there’s always a next time. Any other crawfish recipes you recommend? I’ve got a freezer full of them. It for the tenderness. I also use the sweet peppers that come in a small bag, that are red, yellow and orange. They give a little more flavor too. Add those with the other peppers, onions celery your Browning some . This is my first gumbo I made it with crawfish from our last boil, chicken breast, and link deer sausage that was flavored with garlic and green onion when we had it processed. I cannot stand oregano so I skipped it and added a dash or two of Worcestershire sauce to help with the color. Thank you so much for the recipe it was delicious and really easy. I had a craw boil last weekend and had some left over so I tailed them out. I had a couple pounds of meat and was looking for something to make with them. So I found this recipe, grabbed some shrimp and decided to make it. All I have to say is sweet baby Jesus!